However, most of them fall short of anything you can do on your own, on the floor, with just a mat. 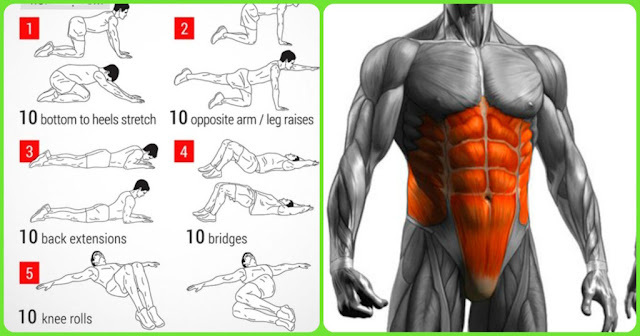 Our “core” muscles, the rectos abdominal (six pack muscle), transverse abdominal/internal/external obliques (human back brace muscles), and the paraspinals (muscles that run along both sides of the spine) are required for every thing we do and any activity we perform. You may be only thinking of your midsection in terms of how it looks in a bathing suit, but when your core muscles are out of shape, you are more at risk for injury. So, get your abs and back in shape AND stay out of rehab with these three, simple exercises! This exercise recruits your obliques and, if done correctly, will be felt on the floor-facing side of your body (just above the hip). The most important thing to focus on is keeping your entire body straight. Notice how the shoulders, hips, and knees are stacked and in a straight line. Also, the modified version on the knees allows for a less intense alternative. Note: Keep elbow directly under shoulder to avoid injury. (Opposite arm/leg extension) This exercise recruits your spinal muscles but also requires some co-contraction of your abdominal. Keep in mind that the balance part is what makes your muscles work harder. Don’t rush through this exercise. You must go slow and controlled as you raise the opposite arm and leg. Keep your spine straight and abdominal pulled-in. The Iliotibial Band (IT-Band) is the tendon that runs from the outside of your hip down to the outside of your knee. IT-Band Syndrome is when the IT-Band gets tight or overstressed which results in increased friction along the lateral leg at the hip and/or knee joint. There may be alterations in the hip that can occur and lead to IT-Band syndrome because of improper biomechanics of the way the foot hits the ground. When performing a crunch for the abdominal muscles it is critical that you protect your neck. If you put your hand around your neck as pictured (not holding your head), you reduce the tendency to bend it. Also, keep one leg bent and one leg straight. This will help you maintain a neutral spine while performing the crunch. Finally, as you go up/down to perform the crunch try to keep tension on your abs by not allowing your shoulders to touch the floor. Think of bringing your rib cage to your hips and pulling in through your abdominal s so you lift your head, neck and shoulders as one unit (avoiding ‘neck-ups’).